GSMArena Team, 31 August 2017. The LG G2 and G3 were early examples of large-screened phones that didn't feel clunky. It's a shame that the company got distracted with curvy phones and modular designs, but with the G6 and now V30 we're back on track - large screens are in and thick bezels are out. You could say that in 2017 we finally shed the final vestiges of button-operated phones - the front belongs to the screen and nothing else. 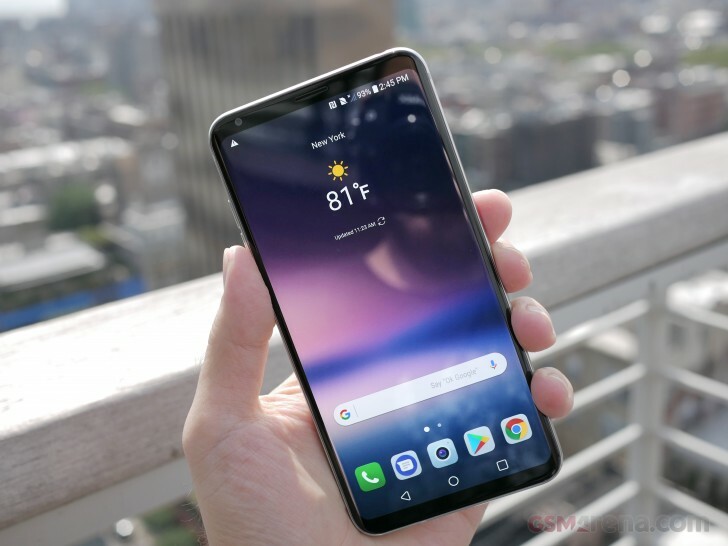 LG's V-series experimented with having two screens on the front, but ultimately, one proved to be enough (a wider aspect ratio helps make up the difference). This is a P-OLED screen manufactured by LG. You may remember those from the Flex series, but those were still immature. The tech has improved significantly since then, finally allowing it to hit marketable resolutions - QHD+ or 1,440 x 2,880px in this case. The new display keeps the best features of the old one - 10-bit HDR and Always on (AOD) specifically. The signature secondary screen of the V-series was dropped since a combination of AOD and the Floating Bar offer the same functionality. And LG can afford to tack extra stuff onto the screen since there's more room (it has an 18:9 aspect ratio). What LG did keep of previous V-series phones is the ruggedness. The sleek curves of the metal and glass body may not look like it, but the LG V30 is IP68 dust and water-resistant and is MIL-STD-810G compliant. Unfortunately, the removable back cover is no more and the battery is sealed. Speaking of, the battery has 3,300mAh capacity. It's not huge given the size of the phone. You do get Quick Charge 3.0 over the USB-C port (enough to fill the battery to 50% in half an hour) along with wireless charging. And there's the Qnovo that will extend the battery's life over many charge cycles (yes, the same tech that Sony was bragging about). As mentioned earlier, the screen covers 82% of the front. Its corners are rounded (just like on the G6) and Gorilla Glass 5 is rounded too (unlike the flat G6). The back (which is made of the same material) has a more pronounced curviness to it as well, which gives you a better grip on this 6" phone. It is very shiny (which we like), but also much more slippery than the rubber panel of the V10. However, V20's metal back didn't leave much grip either. Reading that the LG V30 has a 6" display tells you that it has a bigger display than its predecessor. But it's only until you see them in person that you appreciate that the V30 is smaller than its predecessor, an amazing feat achieved with the magic of thin bezels. The V30 follows the design of its predecessors when it comes to button placement. The fingerprint reader is on the back, below the camera, and doubles as the power key. The volume rocker is on the left edge of the phone, same as the V20 and G6. You could unlock the phone with the fingerprint reader, of course, but you can also use face or voice recognition as well as LG's Knock Code. LG reminds us that you can enable all security options (knock, fingerprint, face, and voice recognition) and use any of them to unlock the phone. The LG V30 boasts a 3.5mm audio jack (yes, this is something to brag about these days) along with the Quad DAC setup that LG has been pushing in recent years. Previous V-phones had excellent audio quality, we can't wait. The audio features extend to the microphones. Acoustic Overload Point mics are not new to the series, but they make a world of difference when recording a concert or other loud venues. Phones went from busy fronts and plain backs to having things the other way around. We think that LG did a good job of arranging the multiple elements - camera, flash, Laser AF, fingerprint reader - in an aesthetically pleasing way. We won't name names, but other makers have made an asymmetric mess.